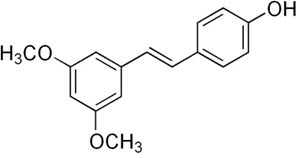 Pterostilbene (trans-3,5-dimethoxy-4-hydroxystilbene, PTE) is a naturally derived polyphenol antioxidant found in blueberries, grapes, and in the bark of the Indian Kino Tree. Pterostilbene is gaining a reputation in the nootropics community for controlling brain inflammation, boosting dopamine, helping reverse cognitive decline and fighting brain cell aging. Neuroprotectant. Pterostilbene is a potent antioxidant and anti-inflammatory. It reduces reactive oxygen species (ROS), and increases the antioxidant glutathione and superoxide dismutase (SOD). [v] Crucial to overall brain health, maintaining signaling pathways and leading to improved learning and memory. 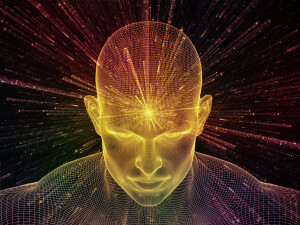 How does Pterostilbene work in the brain? 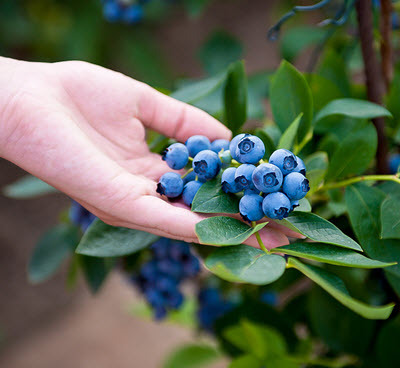 Pterostilbene (trans-3,5-dimethoxy-4-hydroxystilbene, or PTE) is a naturally-derived polyphenol antioxidant primarily found in blueberries and the Indian Kino Tree. Pterostilbene and resveratrol are both ‘stilbene’ polyphenols. And both boost cognition, learning and memory. But Pterostilbene works differently than Resveratrol. And is not a replacement for Resveratrol. Resveratrol has been getting a lot of press lately because of its ability to boost learning, memory and cognitive power. But Pterostilbene is much more bioavailable than resveratrol. And may be the preferred polyphenol to add to your nootropic stack. PTE stands out because of its structural differences from Resveratrol. Pterostilbene has two methoxy groups and one hydroxyl group. 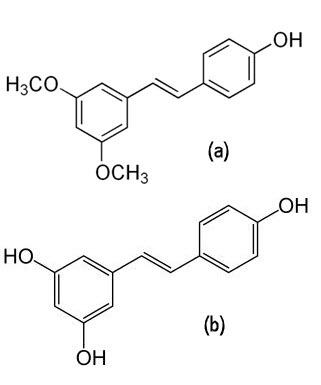 Resveratrol has three hydroxyl groups. This combination in Pterostilbene improves lipophilicity which means it can dissolve in fats, oil and lipids. Lipids are what makes up the shell or membrane encasing each one of your cells. So Pterostilbene can more easily cross through your cell walls. In fact, several published studies refer to Pterostilbene as having much better bio-activity than Resveratrol. You can easily add Pterostilbene to your diet. 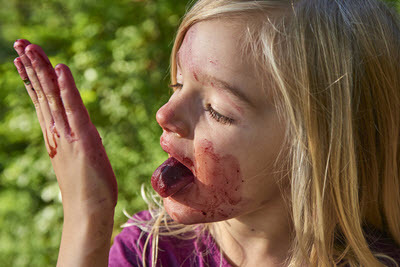 It’s found in blueberries, cranberries, sparkleberries, lingonberries, grapes, and in the bark of the Indian Kino Tree. But to get the therapeutic benefits of PTE, a preferred way of getting this potent antioxidant is to take it as a supplement. Pterostilbene has been shown to prevent the loss of the neurotransmitter dopamine from memory centers in your brain. Supplementing with PTE raises its levels in your hippocampus which is where memory is processed. Pterostilbene also has the effect of caloric restriction on cells which profoundly effects gene expression. This tricks your body into improving memory because it’s thinking there is food scarcity. And it provides an adaptive response. The polyphenol Pterostilbene increases neuroreceptor sensitivity which improves neuronal signaling. And PTE promotes the formation of new synaptic connections which boosts neuroplasticity. Improving long-term potentiation resulting in formation of long-term memories. Pterostilbene boosts brain health in several ways. But two in particular stand out. And this gene modulation is linked to increases in CREB and Brain-Derived Neurotrophic Factor (BDNF). An increase in BDNF helps long-term potentiation needed for the development of long-term memory. In this study, researchers supplemented aging animals with blueberry extract for 12 weeks. This extract contained PTE. Spatial working memory tasks emerged within 3 weeks of supplementation. And persisted for the remainder of the testing period. Pterostilbene boosts dopamine. But it increases dopamine in kind of a ‘back door’ approach. We have plenty of research showing that neurodegeneration is caused by oxidative stress. And that anti-oxidants can stop and even reverse damage to neurons. Potentially leading to an increase in the release of important neurotransmitters like dopamine. PTE is a potent antioxidant. One study done a Tufts University in Boston investigated stilbene compounds like PTE and their effect on reversing the effects of aging. The researchers used 344 Fisher rats and gave them either a low (0.004%) or a high (0.016%) concentration of Pterostilbene. As we get older, the chemistry in our brain cells and energy metabolism changes. All of these age-related changes are contributing factors to the neurodegenerative diseases of aging including Alzheimer’s, Parkinson’s and dementia. But even if things haven’t degenerated to such a debilitating level, PTE can help. Pterostilbene helps improve memory and provides neuroprotection through different mechanisms of action than most other nootropics in a typical stack. PTE works primarily through gene expression. Easily passing through cell walls, PTE modulates genes that influence other proteins, mitochondria and even cell DNA. 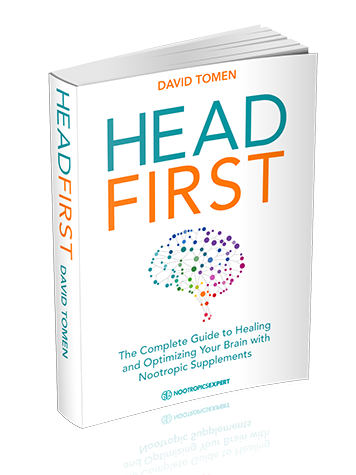 We talk a lot about apoptosis (programmed cell death) as a negative event in nootropic circles. But the reality is that apoptosis is an integral part of a healthy brain. Some supplement makers are mistakenly marketing their Pterostilbene as an “upgraded-version” of Resveratrol. Likely because PTE has better bioavailability. But the research shows Pterostilbene and Resveratrol work together to boost cognitive health. Resveratrol works at the beginning of the cascade of neurochemical events that activates genes leading to cognitive benefits. And Pterostilbene provides its gene expression effects in the downstream portion of this molecular cascade. Pterostilbene has a kind of ‘reverse effect’ on boosting dopamine. Rather than directly increasing dopamine levels like some nootropics, PTE prevents the loss of dopamine in brain memory centers. This is not nearly as strange as it sounds. Because this mechanism of action is similar to how Ritalin works as a stimulant. By preventing the uptake of dopamine by neuroreceptors, Ritalin keeps more dopamine available for increased alertness, cognition and memory formation. PTE prevents brain injury from lack of blood flow and could have profound applications in the recovery from stroke. This effect could be beneficial even in healthy brains who suffer from brain fog due to poor cerebral circulation. Neurohackers report that supplementing with Pterostilbene boosts energy levels, provides clearer thinking and improved mood. Taken before an anxiety-producing event, PTE takes the edge off with no sedation. Aging baby boomers report feeling younger after using Pterostilbene. They feel more alert, less joint and lower back pain, more energy, less anxiety, and better focus. We have hundreds of studies talking about the benefits of Resveratrol. But mostly animal studies for Pterostilbene. So just bear in mind that life is not a clinical study. Take what you can from this article on PTE, and read user reviews on some of the major sites. Then add Pterostilbene to your stack and see if it makes a difference in your life. If you notice a difference, please bookmark this page, come back and leave a comment below this piece. And help other neurohackers out. A study at the University of Mississippi investigated using Pterostilbene for anxiety disorders. Using mice, the team administered PTE in 1 – 10 mg/kg doses. Measuring the effects of each dose for its anxiolytic effect. The research team found that no anxiolytic (anti-anxiety) activity was found at higher doses of Pterostilbene. But at lower doses of PTE (1 and 2 mg/kg), there was significant anti-anxiety activity in the brain. And unlike standard anti-anxiety drugs, there was no impairment of motor movement. In other words, there were no negative physical effects of using PTE for anxiety issues. Recent studies have shown that Pterostilbene and Resveratrol protect against age-related diseases like Alzheimer’s. So this study looked at comparing the two ‘stilbenes’ to find out which was more effective in improving cognitive deficits, and Alzheimer’s pathology. The pathology of Alzheimer’s can be broken down into; cellular stress, inflammation and other pathology markers known to be altered in the disease. Researchers at Case Western Reserve University in Cleveland, Ohio looked at the mechanism of action behind each of these pathology markers. They used SAMP8 mice which are bred to model age-related Alzheimer’s. Two months of a Pterostilbene diet (but not Resveratrol) improved radial arm water maze function in these mice compared to controls who were fed a standard mouse diet. This is where it gets good. Markers of cellular stress, inflammation, and Alzheimer’s pathology were all positively modulated by Pterostilbene. The team concluded that “diet-achievable doses of Pterostilbene is a potent modulator of cognition and cellular stress”. Much better than Resveratrol. The research team said that this success in improving cognition with Pterostilbene was due to its ability to increase peroxisome proliferator-activated receptor alpha (NR1C1) expression. This particular receptor is encoded by the pPARA gene. And as you may recall from earlier in this article, Pterostilbene’s big claim to fame is ‘gene expression’ and modulation. 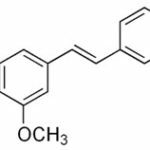 Pterostilbene is one of the only nootropics that improves cognition directly by modifying genes (gene expression). Blueberries have been reported to provide long-term neuroprotective effects. But researchers in China wanted to dig deeper to determine what in blueberries provided this benefit. Was it Pterostilbene? The research team dosed mice with 2.5 – 80 mg/kg of PTE for 3 days. Then induced a middle cerebral artery occlusion for 90 minutes. In other words, they gave the mice a stroke. The team gave the mice another dose of PTE immediately after the stroke, at 1 hour and at 3 hours. The team found the most therapeutic window for neuroprotection was 1 hour after the stroke dosed at 10 mg/kg. Pterostilbene improved motor function, eliminated blood flow disruption, increased neuron survival and reduced cell apoptosis (cell death). The team concluded that you could protect the brain from stroke using Pterostilbene. Pterostilbene is found in small quantities in some plant foods. A cup of blueberries for example, contains only about 20 mcg of Pterostilbene. But even in small amounts, Pterostilbene is believed to provide some of the benefits talked about in this article. Based on all of the published animal studies, the recommended daily dose of Pterostilbene is 50 mg for cognitive benefit. The primary “side effect” of using Pterostilbene in your nootropic stack is – you’ll feel better. You should have more energy and thinking should be clearer and faster. And Pterostilbene provides an anti-anxiety effect. Pterostilbene is non-toxic and supplementation is well-tolerated by most people. 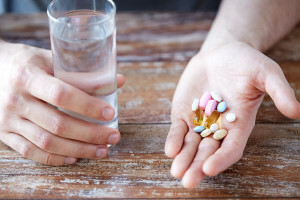 One randomized, double-blind placebo-controlled trial conducted at the University of Mississippi School of Pharmacy did an analysis of safety in humans. 80 subjects were divided into four equal groups. Each group received either; 125 mg of Pterostilbene twice daily, the 2nd group 50 mg twice daily, the 3rd group 50 mg plus 100 mg of grape extract twice daily, and the 4th group a matching placebo twice daily. The trial ran for 6-8 weeks. But the benefits from Pterostilbene follow a bell-curve. With little or no benefit at lower doses, optimal benefits around 50 mg per day, and no benefit again at much higher doses. Like other nootropics, more of Pterostilbene is not necessarily better. Pterostilbene comes in tablet or capsule form and is available by several well-known supplement makers. 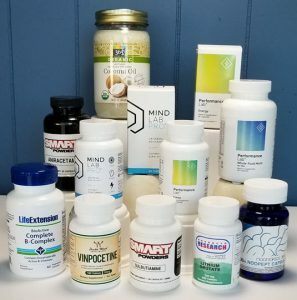 Some pre-made nootropic stacks include PTE in their formula. pTeroPure® is a branded form of Pterostilbene derived from blueberries. And marketed as yielding 99.9% purity. You can also get Pterostilbene from blueberries. But you’d have to eat a lot of berries to get your quota of 50 mg per day. Blueberry extract supplements contain Pterostilbene. But do not typically indicate exactly how much is in the extract. 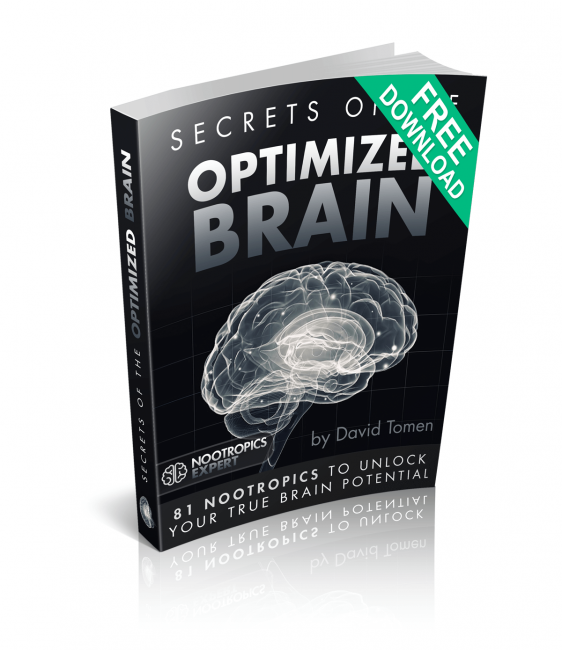 We recommend using Pterostilbene as a nootropic supplement. Your body does not make Pterostilbene on its own. You can get some Pterostilbene from blueberries and a few other fruits. But studies have shown we may not get an adequate supply of Pterostilbene from food sources in our diet. Especially if you don’t eat a lot of fruit every day. Pterostilbene has been used in Ayurvedic medicine for thousands of years as a “blood tonic”. Pterostilbene helps protect neurons, and boosts other antioxidants that shield your brain cells from oxidative stress. Protecting brain cells in memory centers of the brain helps boost dopamine. Resulting in better alertness, learning and memory. The boost in memory and learning also comes from Pterostilbene’s ability to promote neuroplasticity. And PTE helps maintain cerebral circulation by protecting brain blood vessels from lack of oxygen, and oxidative stress. Pterostilbene is especially helpful for those dealing with anxiety. PTE provides an anxiolytic effect without the sedation you’d normally get from using anti-anxiety drugs. We suggest starting with a dose of at least 10 mg daily. And Pterostilbene is a great compliment to a stack including any nootropic. It works particularly well when combined with Resveratrol. Great write-up! I was wondering one thing however does this replace Resveratrol or is there reason to take both? Sorry just read your very last line about combining… what if any synergistic benefits? Probably best to take both if price isn’t an issue… I take both fish-oil and krill-oil for example. Rick, it certainly wouldn’t hurt to use both if your budget allowed for it. There are studies that show Pterostilbene as having much better bio-activity than Resveratrol. So if you could only choose one I would choose Pterostilbene. Ok good to know, from reading around online it sounds like others are taking both without any adverse reactions. Thanks for the great information. I’m shopping around for Pterostilbene. I see two types offered: Pterostilbene and Trans-Pterostilbene. Is there a difference? It appears the Trans-Pterostilbene may be the synthetic version. Mike, Pterostilbene and Trans-Pterostilbene are the same thing. Nearly all Pterostilbene is synthetic and sourced from China. 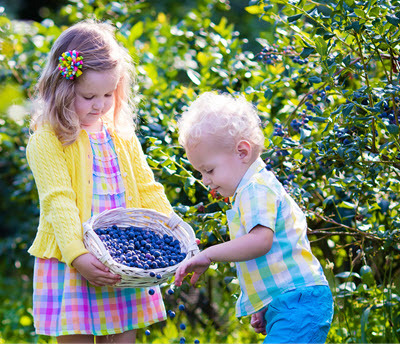 The company who makes pTeroPure® claims it’s nature-identical and sourced from blueberries. I can’t find any way to verify this but usually if a nutrient is “nature-identical” it means it’s made in the lab using yeast. Which is a good thing because it’s the same form as what you’d get from blueberries. So my only recommendation at this point with the information I have is look for a supplement that contains pTeroPure®. And disregard Pterostilbene and Trans-Pterostilbene. Thank you David. I ordered the pTeroPure® from LifeExtension. When you say that it increase dopamine, does it depletes it, like thea ? or does it maintain the lvl in the brain and “use it as needed”. I mean ritalin for instance is an antidepressant who “block” the reuptake. can you explain me a bit more the mechanism of dopamine in pterostilbene ? what are the cons of it ? is there even one ? Aeris, Pterostilbene has been shown in some clinical studies to increase dopamine in certain areas of the brain (i.e. hippocampus) through its antioxidant activity. It seems by reducing oxidative stress in these areas if the brain boosts dopamine and dopamine signaling.